How Do You Know? - Digital Wander, Inc.
How Do You Know? is an interactive application with over 500 vibrant pictures and questions to engage critical thinking. How Do You Know? prompts kids to practice making inferences, using visual clues and specific vocabulary to explain how they know. 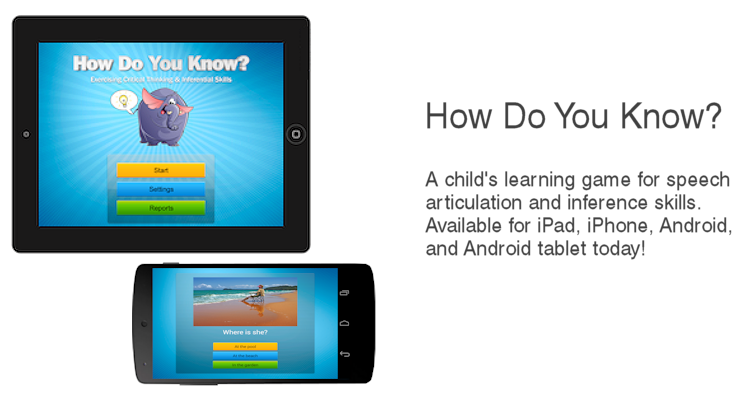 Parents, teachers and specialists can feel confident using How Do You Know? because it was created by an expert who recognized the need for these critical thinking exercises. Lynn Epstein, MS, is a certified speech language pathologist with over 25 years of experience in child language and communication development. How Do You Know? helps both parents and teachers to supplement traditional education by enhancing a child’s critical thinking, verbal reasoning and communication in a fun and interactive format! Making inferences is a skill a student needs to understand social contexts and what’s going on in the classroom. Teachers and therapists will love the amount of categories and practice items. Other handy features include 100 student storage capacity and progress tracking charts. Kids will enjoy the engaging photographs, colorful cartoons and “elephant feedback”. This entry was posted in Android, Android tablet, iPhone/iPad, Montetization Strategies by digitalwander. Bookmark the permalink.